In recent days, the Wall Street Journal and Business Week have pointed to a slight uptick in interest rates on Treasury securities as evidence that U.S. creditors—and the bond market more generally—are beginning to worry about the increase in the federal deficit (Lauricella 2010; Goodman 2010). The debt rating agency Moody’s also recently indicated in the New York Times that, while their ratings for U.S. securities is still stable, the U.S. debt may be moving closer to a downgrade (Jolly and Rampell 2010). But if we have learned anything from the financial market crisis, it is that the bond market and credit rating agencies are not the most reliable sources for sound risk analysis. That said, the United States does borrow substantial funds from a variety of creditors, and a loss in confidence in Treasury securities could, in theory, lead to higher interest rates for government borrowing. This year, the federal deficit will reach about 10% of gross domestic product (GDP), pushing up our national debt to about 70% of GDP by next year. However, over the next 10 years, assuming the economy begins to recover, the deficit will shrink: under the Obama administration’s budget proposal, deficits would move quickly to the 4-5% range by mid-decade. Even under this scenario, though, the level of debt will increase, reaching about 90% of GDP by 2020 (CBO 2010).1 Given this level of borrowing, it’s important to keep an eye on whether there is any evidence that U.S. creditors are getting nervous. So far, there is little evidence of a crisis in confidence. In fact, the reverse may be true. It’s not surprising that short-term rates are low, since they are most closely controlled by the Federal Reserve. Long-term interest rates still remain below pre-recession levels and have not yet seen any particular break from recent levels. The most important place to look for hard evidence (not just idle speculation) is in the data on interest rates on Treasury securities. Figure A shows daily interest rates on Treasury securities of various maturities ranging from one month to 30 years over the past 33 months, dating back to pre-recession times when deficits were much smaller. Yields for the short-term bills are currently near zero, as they have been for over a year as a result of the Federal Reserve’s actions to boost the economy. Longer-term rates are higher because investors expect the economy to recover (and the Fed to eventually raise rates); however, the 10-year-note rate remains below 4%, and the 30-year bond remains below 5%. There is little evidence of a dramatic uptick over the last few weeks or months. The path of real (inflation-adjusted) interest rates over this time and over longer periods tells a similar story. Nominal interest rates (as in Figure A) represent a return to investors to compensate for inflation as well as for a risk of default. 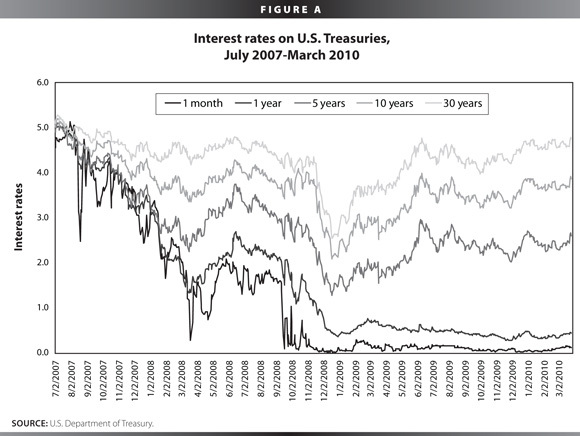 Looking at the real rates in the Treasury’s inflation protected securities, or TIPS, allows one to look only at the non-inflation component of interest rates—and thus to look more precisely at any shift in default risk.2 Figure B shows the real interest rate paid by longer-term TIPS from January 2003 through March 2010.3 The real interest rate is just over 2%, and there is no indication of a major spike up in the default risk of U.S. treasuries. 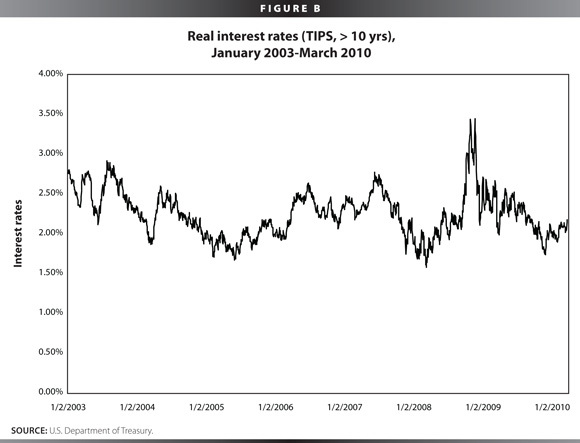 In fact, yields on longer-term TIPS have been fairly stable, mostly ranging from 1.5% to about 3.0% since 2003, and they are currently below their average rate over that period. At some point we may see an increase: if the economy recovers more quickly than expected, a slight increase in rates (especially on the short-end) may result as they return to more “normal” levels. So far there is little hard evidence that creditors have changed their assessment of the value of U.S. federal debt, which still remains one of the safest investments in the world. 1. From a purely arithmetic perspective, deficits need to be small enough so that debt as a share of the economy is approximately stable. This translates into a deficit around 2% to 3% per year, depending upon how fast the economy grows. 2. Though there are other issues unique to TIPS, including, at times, a lack of liquidity. 3. The TIPS series graphed here is the unweighted average yields on all TIPS with remaining maturities of more than 10 years. Congressional Budget Office. 2010. “An Analysis of the President’s Budgetary Proposals for Fiscal Year 2011.” March. Goodman, Wes. 2010. Treasuries drop as economists say spending, employment to gain. Business Week. March 28. Jolly, David, and Catherine Rampell. 2010. Moody’s says U.S. debt could test Triple-A rating. New York Times. March 15. Lauricella, Tom. 2010. Debt fears send rates up. Wall Street Journal. March 26.